It’s been a year since Dina and her ex-best-/boyfriend Bobby broke up. Overworked and burned by one-too-many bad dates, she jumps at the chance to be the bridesmaid at her friend Shane’s wedding in Boracay. It’s 10 days of sun, sea and fun—or is it? Shane is quickly morphing into the Bridezilla to end all monstrous brides. Another bridesmaid, Em, is dipping her toes into dangerous waters. Then there’s the mysterious bartender, Trace, who keeps on bumping into Dina all over the island. Will Dina, Shane and Em keep their cool in Boracay’s sweltering heat? 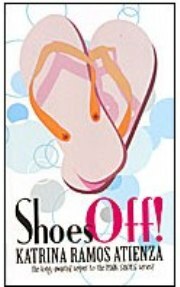 Find out in Shoes Off!, the third installment in the Pink Shoes trilogy. Published August 2009 by Psicom Publishing. 128 pages. Available at National Bookstore, Fully Booked, Powerbooks and Booksale. Hi, I am Kwin. First of all, I am an avid fan of yours since Pink Shoes and If the Shoe Fits. I never knew it was a trilogy until I finished the second book. I bought your first book at the MIBF 2010 and fell in love with it. And for the second book, I was just scooting books at NBS last month when i saw it and immediately bought it. Just now, i searched your name on the internet and is completely shocked that there really is a 3rd book. After all my drama, I do wish you could give me details or a specific store that has that 3rd book, because I contacted NBS and they said they haven’t had a copy of that book for quite some time. I wish you could help me give this trilogy an ending. I wish you the very best of luck in writing and in life. May you shine as one of the best writers of our country. 🙂 God bless.